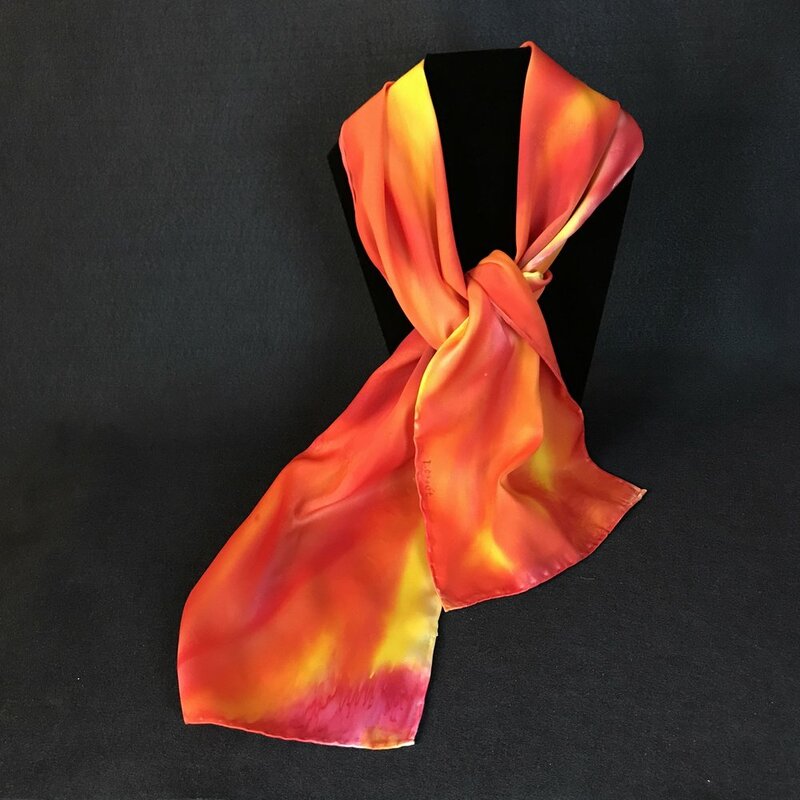 Diane specializes in silk art, including silk paintings, scarves, hangings, handkerchiefs, and more. Her brilliant use of color and vibrancy makes for an excellent addition to any decor. Her inspiration from painting nature scenes in watercolor is evident throughout her work. "As a child in rural Pennsylvania, I grew up watching my mother paint and sketch ideas for clothing she wanted to create. Most of my time was spent outside, building forts, exploring old homesteads and pretending I was a wild horse. My ties to the outdoors remain strong. Watercolor was a perfect medium as it was light, portable and could go on any adventure. It has really helped me see my surroundings in a more appreciative and detailed way. I love the colors and free flowing way the paint goes on the paper. It seems to be in tune with the unpredictability, adaptability and movement of nature. It never turns out the same and is always a surprise. Silk painting has the free spirit of watercolor with the added advantage that you can wear it and it feels so good. For 30 years I have loved working as a physical therapist in Missoula, Montana with folks of all ages, helping them do things they never thought they could do again. It has given me an appreciation for movement and anatomical structure which helps me find balance in my paintings." Our featured artist changes every month, filling the gallery with new and exciting pieces every time. Every second Friday we host a Culture Crawl event from 5:00 to 8:00 pm. Come visit the gallery to meet artists and share in delicious hors d'oeuvres! For more information, please visit our Gallery page.